Have you ever seen the old movies where a paddle boat is lazily going down the river? I love those boats and thought it would be fun to take a ride on one. I found boats that offer different day and dinner cruises, and there is a paddle boat that offers overnight cruises as well. On the day I decided to take the boys, they had a kids pirate cruise. I had to wake up Higgins when it was time to go, so there was a distinct lack of happy pictures as we boarded the boat. The boys each got a paper pirate hat, treasure map, and an eye patch. Of course there was a photo-op as you boarded and the crew were all dressed as pirates or in pirate wench costumes. The cruise lasted about an hour and a half. 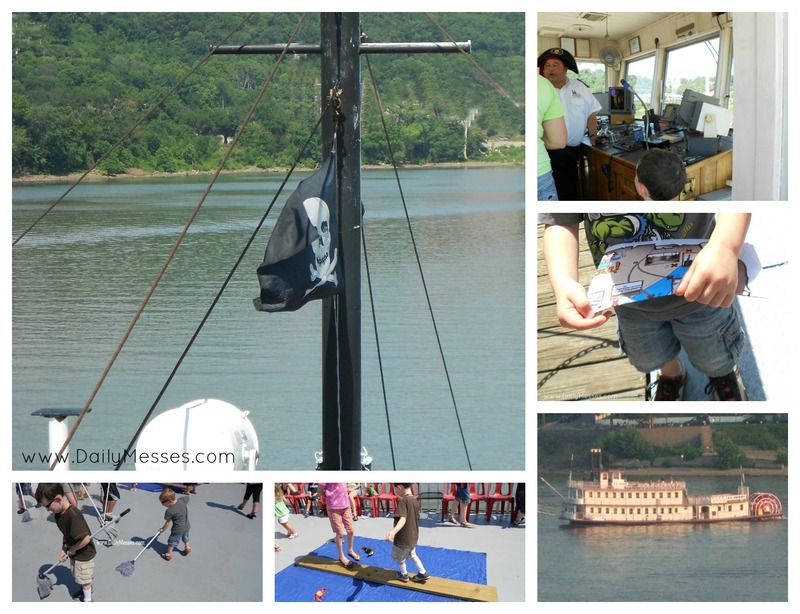 There were a few different activities available on the ship for the kids to do. There was a walk the plank area (blue tarp with a 2x4 for the plank and plastic fish and crabs on the tarp), a face painting and tattoo area, swab the deck (the staff had buckets of mops for the kids to mop the deck with), and of course the treasure map. The captain announced different local tourist information, as well as pirate facts during the cruise to complete the treasure map. At the end of the cruise, the kids got to go through the captain's room and pick out a prize. The boys had a great time, especially since they got ice cream. I loved taking them on a paddle boat ride. We sat for several minutes just watching the wheel turn. The company offered other types of cruises too, so I think we will try to go back and try another one. There were different options, including dinner, lunch, ice cream socials, and even a murder mystery cruise. I think you could find a cruise to fit almost any age!